A possible fight between Amir Khan and Vijender Singh has been the talk of the town after the latter's win over Ernest Amuzu. Vijender Singh has won his 10th straight bout in professional boxing after turning pro in 2015. He retained the WBO Asia Pacific and WBO Oriental Super middleweight titles after beating Ghana's Ernest Amuzu in a gruelling fight. Giving rise to speculations about the much awaited Vijender-Amir fight to prove their respective dominance. Amir Khan is a British boxer who has won the Silver medal at the Athens Olympics and has won 31 out of 35 professional games he has fought in. He has been inactive since May 2016. Amir Khan has not been in the best of his form lately as after winning his first 18 bouts in professional boxing he has lost 4 since then. 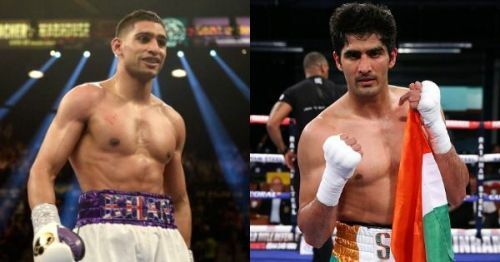 Amir Khan, being of Pakistani descent, and Vijender Singh being India's most successful pro-boxer till date, have created a constant round of speculation of a fight between them by the fans of the two. After Vijender Singh's victory against Ernest Amuzu in Jaipur on Saturday, Chinmay Bhogle, the son of famous cricket commentator Harsha Bhogle tweeted out to Amir, asking about a possible fight between the British boxer and Vijender. However, Khan had a rather curt answer for that. Amir is also yet to fight an Asian opponent and prove his mettle, whereas Vijender defeated China's Zulpikar Maimaitiali in August 2017 to win two titles at the same time. Vijender, on the other hand, believes that since both of them have two World titles, they should fight each other to settle the issue. He wants to fight Amir irrespective of the gap in the weights, which is as much as 12kg right now. Thus, the pressure on Amir will increase to accept the demands of fans and step into the boxing ring after almost 2 years. The time is right for the two boxers to have a go against each other and have the possibly of the toughest fight of their lives, which shall be full of tension, just like any other India vs Pakistan match.